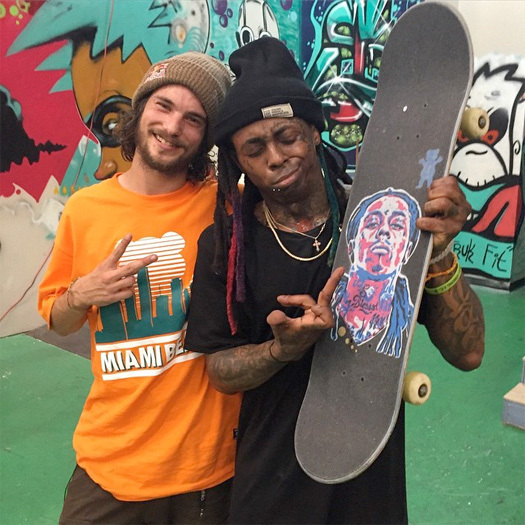 We saw pictures on Saturday, now here is some footage of Lil Wayne going on a skateboarding session with Grizzly Gang’s Torey Pudwill at his private indoor skate park in Miami, Florida on March 27th for Red Bull. At the end of the clip, Weezy sarcastically says that Torey killed it so much that he can now have ownership of the skate park, but the room with the stripper pole in still belongs to him. Hit the jump to watch Pudwill and Tunechi show off their skills! 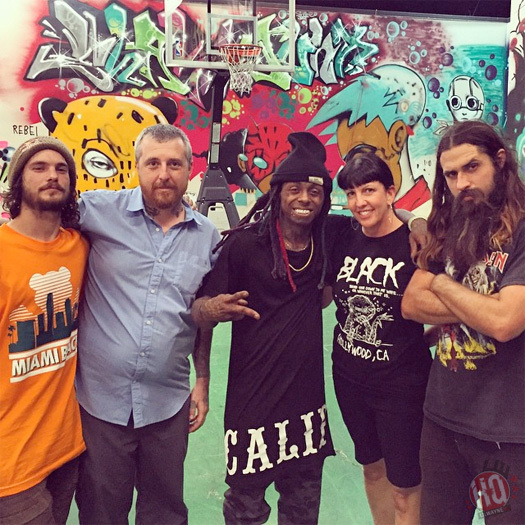 Lil Wayne had a skateboarding session at his private indoor skate park in Miami, Florida yesterday. He was joined by Grizzly Gang’s Torey Pudwill, Erik Bragg, and others. You can view a couple more photos from the skating session below. Don’t forget that Weezy and Mannie Fresh will also be performing live at Red Bull Guest House 2015 later today! 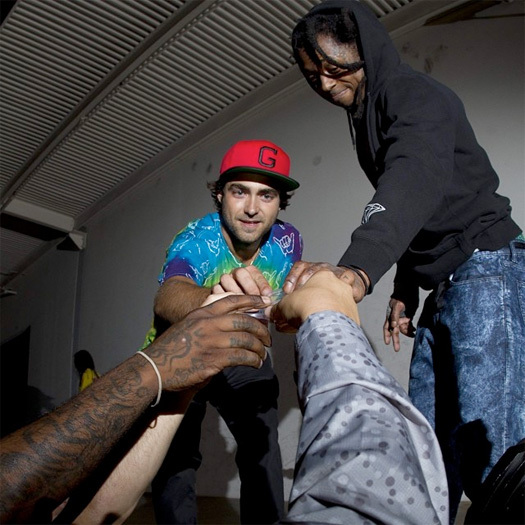 Back in July, Lil Wayne had an early morning skateboarding session with Grizzly Gang‘s Chance Eldridge, Chris Joslin, Dan Abadi, Dave Bachinsky, Jake Dooley, Shuriken Shannon, and Torey Pudwill. Today, Derek Medina has released a video titled “D’usse Grizzly Remix” that you can watch below, which includes footage he captured from the skating session. Click here to view photos! 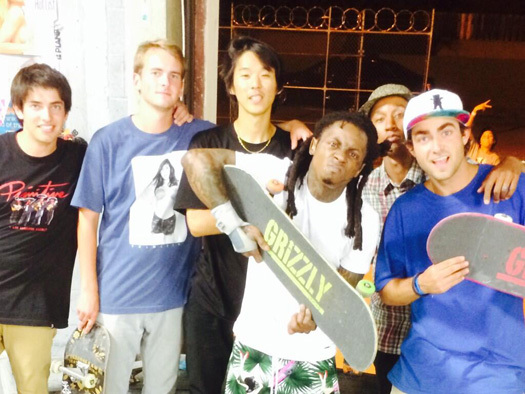 Last week, Lil Wayne went on a skateboarding session with Grizzly Gang’s Chance Eldridge, Dan Abadi, Dave Bachinsky, Derek Medina, Jake Dooley, and Shuriken Shannon. Weezy F Baby skated around the streets at 4AM for an early morning session. You can view 3 more photos after the jump below! Early Saturday morning, Lil Wayne had a Grizzly Gang skateboarding session at an indoor skatepark with Chance Eldridge. You can check out two clips of Tunechi practicing his skateboard tricks, as well as another photo after the jump below. In other Wayne news, Power 106’s Big Boy recently asked Christina Milian about Weezy F Baby. Click here to check out that interview! 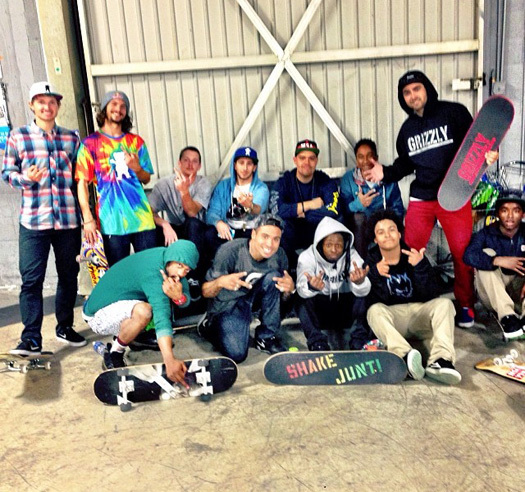 Early Saturday morning, Lil Wayne had a skating session at Paul Rodriguez’ private skate park in Los Angeles, California with Chance Eldridge, Dan Abadi, DJ Scoob Doo, Manny Santiago, Matthew Miko, Shane Oneill, Torey Pudwill, and YoYo. During the session, a guy named Harvey Soto received a FaceTime call from one of his idols Weezy, which one of the skaters had set up. You can watch the FaceTime call below, as well as a clip of Tune watching Torey Pudwill perform a trick on his skateboard.